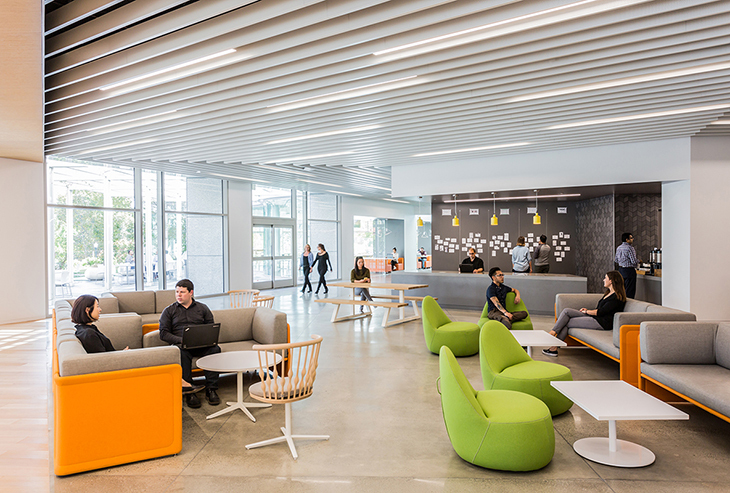 This post is part of a series of blog posts on Gensler’s 2016 Workplace Surveys. That was certainly the case with Gensler’s 2016 U.S. Workplace Survey. When we first launched the survey, we expected choice—a person’s ability to choose where they work—to be on the rise. Our 2013 U.S. Workplace Survey had found that one in three respondents had choice at their places of employment. This made sense, considering the proliferation of mobile technology that has made working at Starbucks or from home or from a conference room as straightforward and doable as working at the same desk every single day. Technology gives us the power to check emails from home in the middle of the night and to collaborate in real time with colleagues all around world. And because choice empowers a person to work in whatever style they find most conducive to success, we expected our 2016 survey to show that more organizations are offering choice to their employees. So you can imagine the shock we felt when we learned that choice is actually decreasing! According to the results of our 2016 U.S. Workplace Survey, which surveyed 4,000 U.S. workers across 11 industries, only one in four people now reports having choice in where they work. That’s a 24 percent decrease in a span of just three years. In a world where choice is increasingly an inextricable component of everyday culture—we choose the methods we use to communicate and the mediums we rely on to receive information—it seems strange that workers report less choice in the workplace now than they did just three years ago. What’s even more surprising, and a tad disconcerting, is the notion that this lack of choice may be inhibiting our capacity for innovation. While the results of the Workplace Survey indicate that choice in where we work is decreasing overall, they also show that employees at companies whose innovation scores are extremely high have double the amount of choice than employees at companies whose innovation scores sit on the low end of the spectrum. Our data suggests that choice goes hand in hand with creativity and innovation, meaning that any organization that limits its employees’ choice could inadvertently be limiting its workforce’s innovation potential. In Gensler’s 2016 U.S. Workplace Survey, 27 percent of respondents reported choice in where they work, which is a 24 percent decrease from the 2013 survey. So what’s behind the overall decrease in choice at work? Why are more organizations limiting choice even though research shows that choice helps organizations foster creativity and innovation? The 2016 U.S. Workplace Survey only reports the results, not “the why” behind the numbers. But in sharing these surprising results with others, I’ve been testing some theories. When the idea of choice first emerged, any choice in when or where to work felt liberating. Technology was finally allowing us to cut the tethers to our desks. We were free to pick up our laptop or mobile device and sit in the cafeteria or across town or even to work from home. We tolerated the glitches, the re-connections, and slow speeds as the price of being mobile. But as technology got better, faster, and cheaper, our expectations rose. What was once considered choice became an expectation. We now expect to be able to work the same way on the road that we do at the office. We expect that our next mobile phone will have all the latest features (and a few new ones that we soon won’t be able to live without!). Likewise, when we choose to work in a variety of settings at the office or choose to work at the same workstation most of the time, it proves that our expectations have shifted. What was once labeled “choice” is now just an everyday occurrence, and so it feels like we have to work that way and we no longer have a choice. This is how what was once considered radical and new becomes status quo. The decline in choice, as reported by the 2016 U.S. Workplace Survey, may simply be the result of respondents identifying activities they previously saw as “choice” as the new normal. Likewise, there are real choices and perceived choices available to all of us. Real choices are active decisions that people make every day. Do I want to go into the office or work from home today? Do I want to take this conference call at my desk or in the conference room? But having the ability to make a choice is not the same as actually exercising that choice and acting upon it. It may, however, be equally important. Let me explain. One of our firm’s clients has a robust mobility program that allows employees to choose between working from home or coming into the office. However, many employees at this company still feel like they need to be at their office desk every single day, because they believe that workers who are present receive more favorable ratings on performance assessments. Others drag themselves to the office because they feel the need to be physically accessible to their teams. Still others report that they can’t easily hear or be heard on conference calls if they are not physically in the room—too many conference calls are a run in a manner that preferentially treats non-remote participants. So in theory, the employees at this company all have a choice in where to work. But in actuality, they feel they do not. The underlying attitudes and perceptions about mobile work versus working at the office have removed that choice and created a sense of disempowerment. Over the years, we have come to assume that as technology improves so does mobility and choice. But that may not really be true. In our 2016 survey, we found that virtual collaboration has doubled in the last three years (from 7 percent to 15 percent of our time in the U.S.) while overall choice has fallen. So virtual collaboration does not necessarily make us more mobile or empower choice; it simply allows us to reach out to even more people from the comfort of wherever our desk chair is located. Eighty-four percent of survey respondents reported working in the same space most of the time, regardless of whether or not they regularly engaged in virtual collaboration. So even if people are virtually connecting with others on a regular basis, that doesn’t mean they are doing so from a variety of spaces. One could even argue that as virtual collaboration becomes more common, the need to physically leave one’s primary desk declines. These theories represent my personal hypotheses on how to explain the statistical decline of choice at American companies. I welcome your own thoughts and ideas. Now, more than ever, creativity and innovation are critical to organizational performance and business success. Choice plays a critical role in this dynamic. We need to figure out how choice and the physical work environment can complement one another and make a positive difference in the lives of workers and the work they produce. Please share your own theory!